HEALTHY... CHALLENGING... FUN... Learn the basics OR fine-tune your surfing skills. As Long Island's and New York's premier surf school and surf camp, SURF2LIVE prides itself on being more than just a "ONE--LESSON" surf school. There are plenty of surf schools that teach you how to stand on a board, but only SURF2LIVE has the systems to turn your surfing dreams into reality... whether you're a beginner, intermediate or are experienced. AND, ABSOLUTELY NO BEACH GAMES. JUST PURE SURF TIME! WHY CHOOSE US? 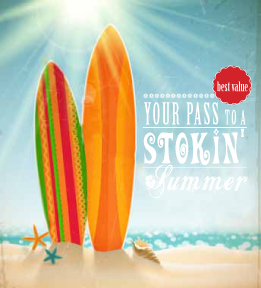 Because we offer the Best Surf Camp Experience! PERIOD. We have been providing these camps for 18 years. We guarantee a fun filled week at surf camp. We have the most experienced Certified Staff of surf instructors. Don't believe us? Ask some of the Parents of former surf campers. We let our reputation speak for itself. Glad you asked, we have been in the business of teaching people to surf for over 30 years and have developed and perfected our surf teaching methods. This is one of the only surf camps run by a professional surfing instructor/coach. Surf Camp Director, Elliot Zuckerman, has devoted his life to introducing people to surfing and improving their surf skills. SURF2LIVE Surf Camp was one of the first officially recognized Surf Schools to be endorsed by National Surf School and Instructors Assocation, The United States Governing for the Sport of Surfing. Full Week class (Mon - Fri): Reg $425. Please note: you can do any three days during the week as a half week. SURF2LIVE Surf Camp in Long Beach is a NY Certified Surfing School. ALL NEW!!! It's never too late to learn to surf. Please note: you can choose any non-consecutive weekend dates. SURF2LIVE Surf Camp in Long Beach is a NY Certified Surfing School. SURF2LIVE offers the best surfing lessons in NY, Long Beach. Group surf lessons are an ideal way for adultd to share the thrill of surfing, regardless of previous experience. $65 per person for 90-minutes of intense instruction. We supply all equipment, so all you need to bring is yourself, a lot of energy and enthusiasm! Surf lessons are by appointment, so make sure you allow enough time to get into the group you want. Please call or email us for the times. This class is great for everyone and it's a great time to make friends and be in the water! Fast-track your surfing abilities with private surf instruction with Certified Master Surfing Instructor/Certified Professional Surf Coach, Elliot Zuckerman. He will tailor each lesson to suit your very particular needs, working on weaknesses while strengthening skills to bring out the very best surfer in you..
For those that take surfing seriously, this is the best way to challenge yourself to become a better surfer. Private surf lessons are becoming increasingly popular over the years. If you want to fast-track your surfing abilities, then semi-private surf lessons are the way to go. A private instructor will tailor each surf lesson to suit your very particular needs, working on weaknesses while strengthening your surfing skills. StandUp Paddle Surf Lessons: Please inquire. SPECIAL NEEDS SURF CLASSES, Proud Sponsor of SurfersWay.org. SURF2LIVE is dedicated to teaching children and young adults with special needs. We are so passionate about sharing this incredible experience with people who might not otherwise engage, that we are now teaching our specialist techniques to surfing instructors worldwide. Each year we also hold many free one-day event for special needs individuals. Please visit our foundations website www.surfersway.org for dates and registration details. If you are a parent of a child with special needs or know of someone that could benefit, please contact us for information at www.surfersway.org about surfing schools and instructors near you that might provide someone who has special needs with the momentous experience of riding the waves.